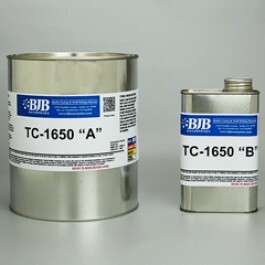 TC-1650 A/B is an aluminum powder filled epoxy casting resin system that provides service temperatures to 350°F (177°C). TC-1650 A/B is most commonly used for the construction of molds that require good heat conductivity, outstanding durability and provide production run capability. TC-1650 is commonly combined with SC-125 Aluminum Granules for casting sections thicker than 1" (25mm) to decrease shrinkage and lower exotherm. NOTE: If casting TC-1650 A/B (without SC-125 Granules) requires sections to be thicker than 1”, use TC-1651 A/B for thicknesses up to 3”. Request BJB technical advice for additional assistance.